My first boyfriend, age 10, went with me to empty lots to help me cut 'free' flowers to bring home. I loved him. 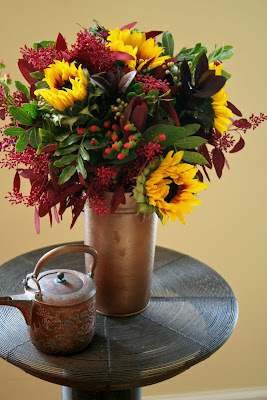 Last week when the SunflowerGuy.com offered me a free bouquet of my choice in exchange for a review, I jumped. I've grown about 20 varieties of sunflowers from seed; used them for seed snacks, for drying, for cut arrangements and in the garden. Can you tell I love them? SunflowerGuy says that through their parent company Dos Gringos, they are the largest grower of ornamental sunflowers in the world; I'm the smallest, so it's a match. 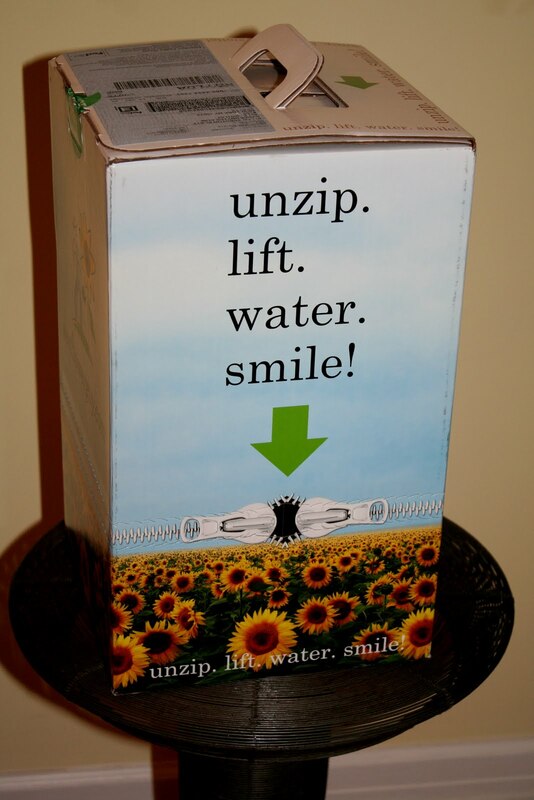 The overnight flower delivery from SunflowerGuy came on the date requested, in an ingenious shipping box that included a simple, tasteful container and the stems wrapped in rubber bands to keep the bouquet intact. See above. I followed all of the instructions for removing and discarding the wet flower foam that kept flowers healthy during shipping, cutting the bottom of the stems, adding the cut flower food. I smiled even without the instructions at the cleverness of the packaging and the cheery sunflowers within. Then I spied the red-painted seeded eucalyptus. The online catalog had said nothing about painted flowers. ugh! It was probably because the red pepperberry was still green and some designer thought the red element was necessary. Not for me. While many people, if not most, love an arrangement that is complete, fun for me is doing my own. In fact most florist designed arrangements have enough flowers & foliage for 4-6 arrangements, so I always divide them up and scatter them around the apartment, even the bathroom. Having fresh flowers wherever I turn is a wondrous thing. When you scroll to the bottom of the post you'll see how I handled the dreaded painted eucalyptus. The five sunflowers went in a collection of glass vases made from recycled soda bottles, one or two stems to a vase. How easy is that? The good looking container that came with the arrangement will not languish but will become part of my varied collection of useful vases. The St. John's wart and a tiny bit of pepper berry went in two small bud vases on a bathroom shelf. These three stems lean gracefully in a contemporary vase in the living room. They look like they'll last well beyond the guaranteed 8 days. In the tree wells in front on my building (this one where the dead tree was chopped down) I lay fresh greens, with additional prunings from the roof garden, including some stems of aronia berries, dried sorghum seed heads and the red painted eucalyptus that even I have to admit doesn't look half bad there. I hope The Sunflowerguy approves. As I write this post I'm on my seventh day and all flowers are still in excellent condition. If you need an overnight flower delivery, especially for sunflowers I think you'll be well satisfied. What a great idea! Never thought to do that, although I have dried old blossoms (especially those of roses) and added the petals to existing bowls of potpourri. Many thanks for sharing and for your beautiful images! That looks like a pretty arrangement! I like how you broke it up into many. I'm prone to do that style as well!